Regular MTI contributor “Serman” takes a look at the new Subaru Impreza Boxer Diesel (Subaru tries boxing clever with its new diesel engine), which could turn out to be an important car for Subaru. Having not received the warmest of welcomes, the new Impreza range hasn’t quite had the same ‘Scooby’ following that its current owners were hoping for. But with a different audience in mind the latest Impreza has to follow the competitive herd if Subaru want the balance sheets to look good in twelve months time. So it’s now time for a diesel. Yes, it is another Subaru Impreza, and for those who look away every time you see one, perhaps you should read on because this latest Boxer Diesel model is really rather good. As you glance at the pictures you may notice that Subaru haven’t been adventurous in the styling department with its latest offering. More importantly, the Impreza diesel has now entered into a fiercely competitive market place and it’s absolutely vital that it makes the grade even if Subaru put their spin on it. Even though it features the world’s first boxer-designed diesel engine one would hope that a styling tweak or too would help raise its profile. Impreza’s are renowned for performance spin-off’s but there isn’t a WRX-diesel on the cards although with the larger factory option rims fitted it looks identical to its turbo-powered Brother. 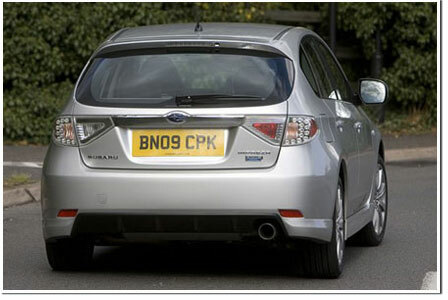 Looks or no looks, it still is a well equipped Ford Focus-sized hatchback. Thanks to a generous level of kit the £20,000 RC model comes standard with climate control, Xenon headlights, a 6CD auto-changer, front fog lamps, heated front seats and cruise control. If you are feeling flush then the RX model (an extra £2,225) will add keyless entry, an electric sunroof, privacy glass, leather trim and electric adjustment for the driver’s seat. Equipment aside, Subaru’s aren’t up to the standards of their rivals in terms of high interior build quality but you’ll be hard pressed to match its generous level of equipment with a similarly priced rival. Overall the Impreza diesel looks like a Xerox copy of the WRX, so it will be down to personal taste whether or not you’re intrigued to know more the minute you first seen one. Despite its odd cylinder layout don’t be put off. This is a very capable and impressive unit. On the road it feels as relaxed as you want it to be but if you drop a couple of gears it surges on impressively. Although not quite as punchy as the more powerful WRX, it’s still an enjoyable drive mostly because of the generous torque available from 1500rpm, peaking at 258lb ft between 1800 and 2500rpm. Although the maximum power of 148bhp is delivered at only 3600 rpm, the engine will rev smoothly to its peak of 5000 rpm making it feel distinctly sportier than the more well known 2.0 litre turbo diesels available. It’s also competitive in a fuel saving sense with 47mpg combined cycle and 155g/km of CO2. It handles well too. Don’t expect it to be similar to say a Golf GT, but with a firm-ish ride, road holding and cornering abilities are geared towards under-steer which isn’t a criticism but it could be a bit more diver focused like many of its sporty rivals. 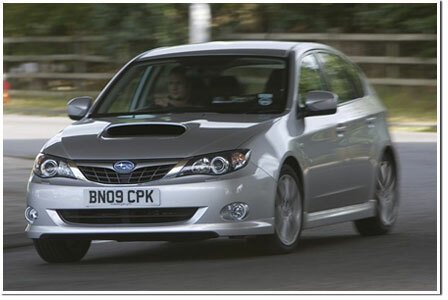 The standard four-wheel-drive system is certainly a benefit in some circumstances although most front-wheel-drive cars nowadays, especially in this market, have the same amount of grip levels making the Impreza’s once superior cornering abilities somewhat redundant now. Steering needs a little more attention and would benefit from a more direct feel but overall this is something that won’t affect the handling package at your disposal. The Impreza certainly has a great road manor about it and will impress most behind the wheel making it both capable as a daily drive and something more sporty when the opportunity arises. If you’re not badge conscious then yes. The Focus, Golf and Astra will always attract more consumers and although the Impreza may not be as competent as its rivals overall, you really need to get out and drive one. 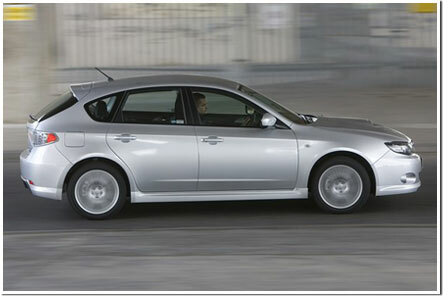 The Impreza Boxer diesel is a welcomed alternative and deep down a very good all round package indeed.